“Ouch!” The little mouse doll squeaked. The cat’s fangs bit into his cloth head. The cat dropped him. The doll rolled in the dirt. He was somewhat muddied from the scuffle, but his fabric didn’t tear. The doll stood and leaned against the tall grass. The cat studied the doll. 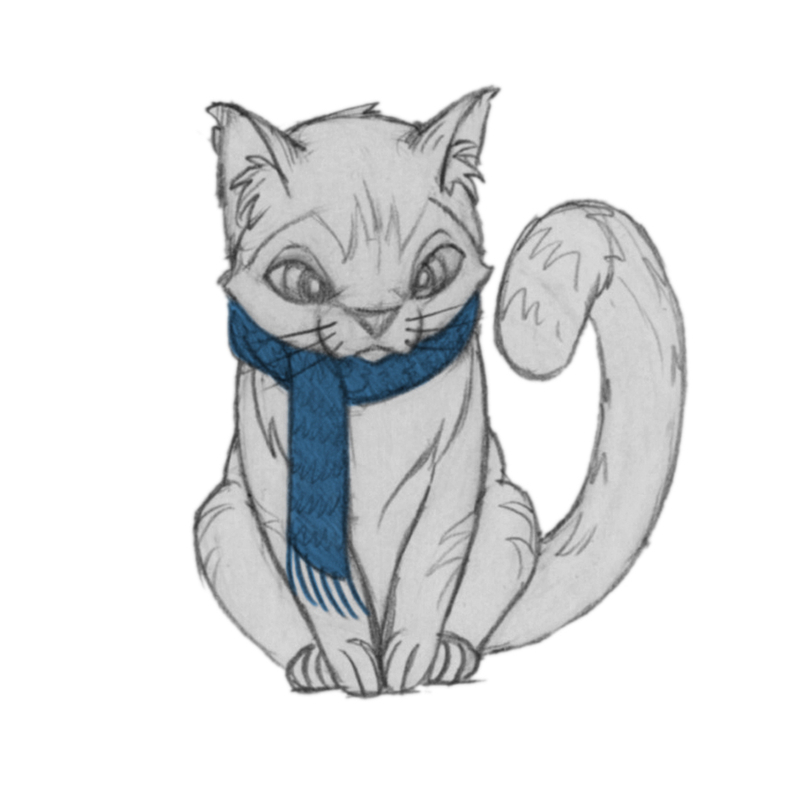 He sat and curled his tail around his furry body and played with his blue scarf. A cold wind blew between them, brushing the cat’s fur and shaking the doll’s wobbled stance. It came from far beyond the meadow with the willow tree where there was darkness. A white flash crossed the black sky and was followed by faint thunder. “You don’t taste like a field mouse,” the cat said, licking his paw and stroking his ear. “What do I taste like?” The doll asked, mimicking the cat’s gestures. “Do I want to be a field mouse?” The doll asked. The wind blew colder and harder. The doll tried to hold on to the tall grass, but fell with a soft thud. He tilted his fluffy nose to the cat. “What does that mean?” The doll tried to yawn, but couldn’t. His mouth was stitches. The thunder grew louder, and the cat glanced at the approaching storm. “Why do you want to do something bad?” The doll asked. The cat stared at the doll, but wasn’t certain if he stared back. His eyes were buttons, after all. “Because that’s what a cat does to a field mouse.” The cat looked away. Thunder boomed. The doll squeaked. The cat was unmoved. “Where did you come from?” The cat asked. “Where did you come from?” The cat asked again. “Where did you come from before that?” The cat asked. “There was no before.” The doll shook his cloth head and his fabric ears flopped. “Not for me,” the doll said. Rain fell on the meadow with the willow tree. “You’re a curious field mouse.” The cat stood and stretched. “Are you going to eat me now?” The doll asked as he stood and stretched too. “Perhaps later.” The cat turned to the tall grass and disappeared into it. “Don’t go!” The doll squeaked. He ran, following the cat, and his cloth body shook. It was the quickest he had moved, but it wasn’t fast. The doll ran into the cat and fell. The cat had stopped when he heard the doll. “I’m not sure what you are.” The cat shook his head. “Why do I have to be anything?” The doll shook his head too. The rain fell harder, and the cold wind blew stronger. The cat ran out of the meadow. Lightning struck and thunder roared. Dark clouds eclipsed the moon. The storm had arrived. The doll shrieked, but pouring rain masked his cries. He shuffled through the tall grass, but it was too thick, and he couldn’t find his way. His cloth body was soaked and caked in mud. His yarn tail dragged behind him like a rock. He could barely move. The doll bawled and covered his fabric ears at a deafening thunderclap. He fell, rolled out of the tall grass and into a puddle, near the willow tree’s roots. He struggled to climb out, but couldn’t. Not far beyond it, barely visible through the rain’s veil, was a cabin with a stone chimney and dim lights glowing from its windows. But the doll wasn’t looking at that. His polished button eyes were wet from rain. They would’ve been wet from tears too, if polished button eyes could cry. And although he didn’t understand what crying was the storm was beginning to teach him. The willow tree’s drooping leaves waved madly in the wind. Its limp branches swung chaotically, whipping and lashing at the dark. But amidst the icy wind, torrential rain and earsplitting thunder, the doll stopped crying. The willow tree’s unmoving trunk, and the heart that was carved into it, despite the pandemonium that raged all around, calmed him. Then lightning struck the willow tree. Willow Tree’s Gift, Now in Hardcover and Color!